Palms at Wyndtree offers all of the amenities that you have grown accustomed to. The beautifully designed clubhouse is the hub of our amenity area and features a business center, state-of-the-art fitness center and complimentary refreshments. Our resort-style pool with expansive tanning deck is the centerpiece of our central courtyard and is surrounded by our tennis court and sand volleyball court. Each of our one, two, and three bedroom apartment homes feature nine-foot ceilings and oversized windows allowing lots of natural light. Our generously sized bedrooms feature large closets with California style shelving. 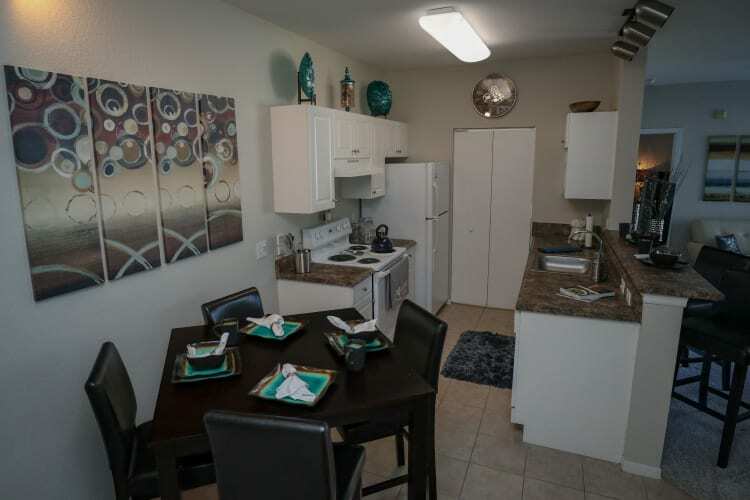 Our well-appointed kitchens have an eat-in breakfast nook and come equipped with microwaves. All apartment homes have laundry rooms with a full sized washer and dryer. Palms at Wyndtree is also proud to offer pet-friendly apartments.